With identity theft becoming more prevalent, and the people who make it happen seemingly getting more wily, it’s never been more important to think about what happens to your confidential documents when their time is up. Luckily, shredders are a quick and easy way to achieve peace of mind when it comes to disposing of sensitive information. Even more luckily, they’re no longer the reserve of the office block, with models specifically for home becoming more affordable and user-friendly. Shredders that don’t jam have long been the stuff of dreams for weary office workers, and now, thanks to jam-proof technology, it’s a dream no more, so look out for those two little words when making your choice. How much you shred, and how often, also has an impact on the models you should consider. Shredders that can handle credit cards, staples, bulky documents and junk mail will cost you more, but are worth it if you shred at high volume. 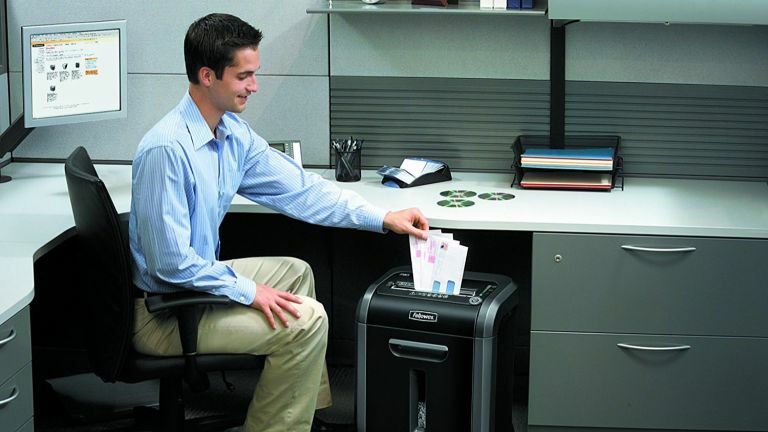 Compact shredders are great for storing in small home offices or moving between rooms, but you’ll have to empty the collection bin a lot more often than with a larger-capacity model. Consider, too, the maximum number of sheets a shredder can handle at once, for optimum efficiency on large loads. Finally, for extra security, each model that has made it out list is a micro cut or cross cut shredder which will slice your documents two ways, making the pieces much more difficult to reassemble than with a traditional ribbon cut. The Powershred 79Ci has earned the top spot on our best shredder list with its 100 percent jam-proof guarantee, meaning those infuriating beeping error messages are well and truly banished. It’s clever in other ways, too. Its SafeSense technology means that, in the event of wayward fingers finding their way to the opening, the unit immediately disables, making it a great child-safe shredder for home offices. It also gives instant feedback, using a red to green colour gauge, when you’re in or out of the recommended capacity range, for foolproof use every time. This compact shredder isn’t made for heavy duty, near-constant shredding – it’s tied with the AmazonBasics model below for lowest maximum page load – but what it does do, it does very well. It’s a small and perfectly formed unit that doesn’t look unsightly or industrial in the home, and can handle credit cards easily. Ideal for occasional use. That this is the second Fellowes Powershred shredder in our top three alone is testament to their brilliance. This bulky beast comes highly recommended for its huge capacity, ideal for users who typically shred large amounts of material at a time (or hate taking the bin out). But thanks to its noise-minimising Silentshred technology, it’s all bite and no bark, a surprisingly nice touch from such a large and capable model. With so many of us working hard and poor on time, Rexel’s claim that their auto-feed technology can save you 98% of your time at the shredder is a tantalising one indeed, and how it works is simple but ingenious. Simply stack your paper (up to a stonking 60 sheets at once) place it in the top, and walk away. If you’re feeling nostalgic, there’s also a manual bypass slot. This AmazonBasics offering might look... well, basic, but simplistic though it might be, it steps nobly up to the task of shredding tougher materials as well as the more standard fare. It makes short work of credit cards and CDs, and when faced with paper, shreds it into tiny micro-cut pieces, an ultra-secure means of disposal usually featured on higher-end models. The clue to the Bonsaii EverShred’s success is in the name: it keeps going, and going, and going. While lesser models tend to overheat after a few minutes of constant operation, making the overall process longer, this cross-cut shredder can destroy masses of documents over 30 minutes without breaking a sweat. As well as having the best runtime of any model on our list, it has a decent capacity, and a transparent window which makes it easy to see when it has filled up.